Proc. Roy. Soc. Edinburgh 11: 513 1882. 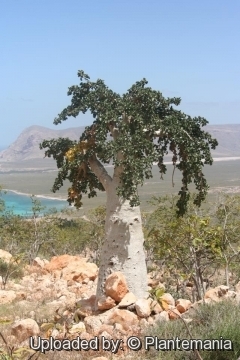 Origin and Habitat: Dendrosicyos socotranus is endemic in Socotra a small island off the "horn" of Africa. There are a few trees on the island of Samhah, but none on Darsah or Abd al Kuri. On Soqotra it is widely distributed in several vegetation types but has a rather fragmented distribution; over large areas there are only isolated trees or small, relict populations, whilst in other ares it is relatively abundant. Altitude range. Sea level to 500 metres. Habitat and ecology: This species is part of the the succulent shrubland and most distinctive vegetation of the island. 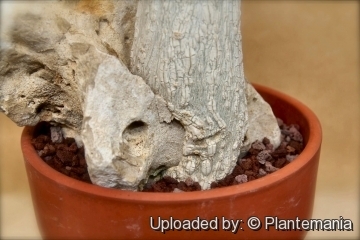 It grows in dry areas together with scattered tree succulents such as Croton socotranus, Adenium socotranum, Euphorhia arbuscula and Ziziphus spina-christi. Grasses and herbs develop only after sufficient rainfal. Dendrosicyos socotranus occurs mainly on the coastal plains and low inland hills on calcareous soils, less common on igneous rocks; rare on Samha. The species is well-adapted to dry sites. It is widely distributed in several vegetation types but has a rather fragmented distribution; over large areas there are only isolated trees or small relict populations, whilst in other areas it is relatively abundant. Seedlings are subjected to overgrazing and regeneration may be compromised over time, except for seedlings protected from goats by the spiny shrub Lycium sokotranum or by Cissus subaphylla. Where there is no Cissus or Lycium, there is little if any regeneration. At present, the main threats to this flagship species are its use as a drought fodder. The species is considered vulnerable. 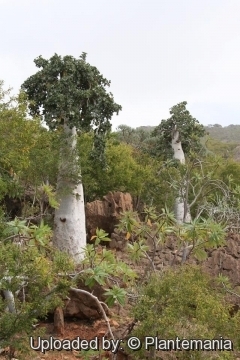 In the main, with its swollen, water-storing stem it is well adapted to withstand drought conditions and should therefore be better able than many species to tolerate any drying out of the Archipelago due to climate change. However, in times of severe drought trees are cut-down, pulped and fed to livestock. In some areas (Kilissan) this has resulted in its almost total eradication. 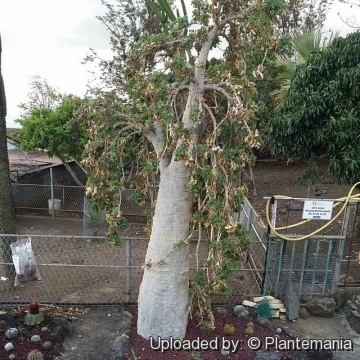 Description: Dendrosicyos socotranus is a perennial succulent-stemmed tree with a bloated trunk, 3 (-6) m high and to 1 m in diameter and few, thick, pendent branches. 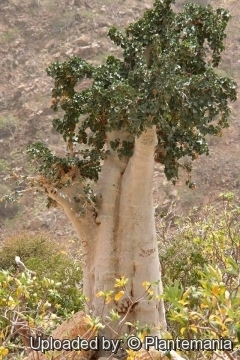 The bottle tree growth form making it distinctive and perhaps the best example of the swollen-trunked bottle-trees for which Soqotra is famous. 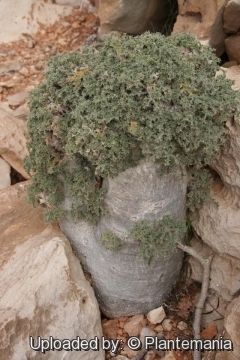 It is the sole tree in the Cucurbitacee family, resulting from an extreme case of pachycauly, and one of many Suquotran plants that has adapted to seasonal rain and drought by storing water in its tissues. Dendrosicyos socotranus is monoecious, that is to say that males and females are present on the same plant for cross pollination. The flowers are yellowish-orange with long petals and the fruits are ovate. The seeds are about 6 mm. 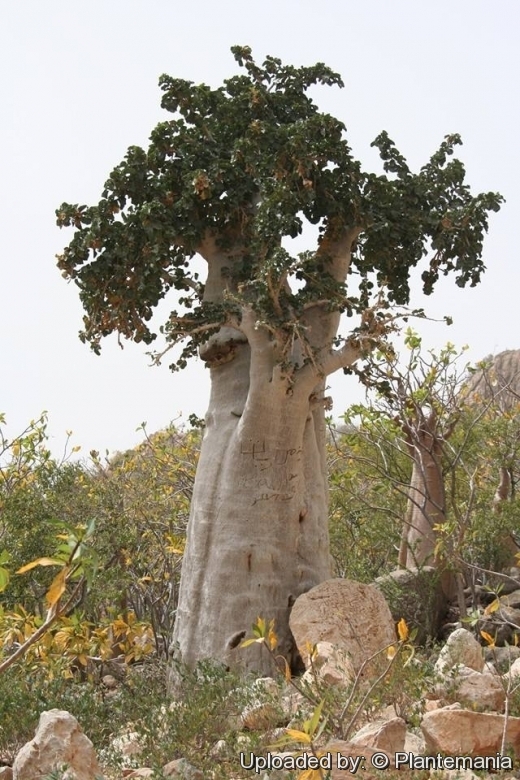 Derivation of specific name: The name Dendrosicyos socotranus means 'cucumber tree of Socotra'. Stems: It has a bottle-shaped trunk of fibrous wood (pachycaul) and a small crown formed by few, thick, pendent branches with small twigs. The trunk reaches a diameter of up to one meter. Trunks are succulent, but not bottle-shaped when young. Leaves: Arranged in spiral, about 25 cm long and wide, ovate-cordate to nearly round, deeply or slightly toothed with 4-6-lobed, prickly, the margin serrate, covered with fine bristles, with characteristic, unpleasant odor. The leaves, which are extremely prickly in vegetative growth became larger and less prickly with time. This species does not produce tendrils. Flowers: Yellow, medium-sized (2.5-3 cm in diameter), in pendent axillary fascicles near the tips of the shoots. Receptacle-tube funnel-shaped. Sepals anceolate; petals linear-lanceolate, yellow, tomentose. Male flowers stamens 3, inserted on mouth of the tube, exserted. Female flowers can be picked out by the inferior ovary (looks like a small zucchini just below the flower) that is ovoid, smooth, rostrate. The style is long, slender with 3, 2-lobed stigmas. Staminodia 5. The plant produces flowers when five years old. Seeds: c. 3 x 5-6 mm, compressed, green, turning brick-red when ripe, with a very fine velvet layer covering the flat sides. Remarks: The species name was originally spelled Dendrosicyos socotrana, but this is corrected to masculine grammatical gender according to the International Code of Nomenclature for algae, fungi, and plants. Notes: A recent molecular phylogenetic analysis of the family Cucurbitaceae found that the Dendrosicyos lineage is about twice as old as the island, and thus seems to be an island relic of a progenitor lineage that became extinct on the mainland. 1) Wikipedia contributors. "Dendrosicyos." Wikipedia, The Free Encyclopedia. Wikipedia, The Free Encyclopedia, 7 Nov. 2016. Web. 7 Nov. 2016. 5) Schaefer, H., Heibl, C., Renner, S.S. 2009. “Gourds afloat: a dated phylogeny reveals an Asian origin of the gourd family (Cucurbitaceae) and numerous oversea dispersal events.” Proc. R. Soc. B 276: 843-851. Cultivation and Propagation: Dendrosicyos socotranus is a truly unusual and in cultivation, an extremely rare plant. It is however fairly easy to grow both indoors, as well as outdoors in warm climates. It responds well to cultivation if correctly drenched and fertilized, and if the temperature is greater than 20 °C. Individuals in their natural habitat can attain 3 or more metres in height. Growth rate: It is a fairly slow growing plant. Soil: It needs a draining cactus potting mix. Repoting:* Repot the plant every 3 years. Waterings:* It needs regular water when the plant has leaves, contrary to popular belief, it likes a lot of water in the warm summers, as long as it's planted in a very well draining soil. Indoors it is best to err on the dry side, or it is prone to rot. Hardiness: It is tender. Absolute minimum temperatures should be held to between 10-12 C during the winter months. Exposures: It like full sun to light shade with warm temperatures. *Propagation: Seeds. Plant the seeds in the summer in pumice about 5 mm deep. Watering should be regular and generous. Germination occurs within two weeks at over 90% (seeds must be fresh). It seems no after ripening is necessary as is the case in some desert plants. Seeds do not need to be scarified. In the first few years the plants grew relatively fast the trunks are succulent, but definitely not bottle-shaped. This would come in time. 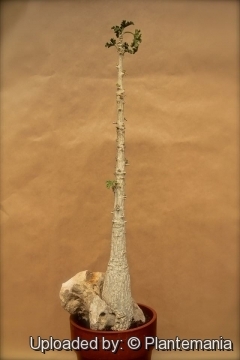 Well grown specimen can produce flowers at five years from seed. Attempts at rooting cuttings always failed.